WHAT HAPPENED: The King of Clay is once again the Hero of the Hard Court. Rafael Nadal won his third US Open men’s singles title with a 6-3, 6-3, 6-4 victory over first-time finalist Kevin Anderson inside Arthur Ashe Stadium on Sunday afternoon. The win gave the 31-year-old Spaniard his 16th Grand Slam crown, the second-most of all time behind only Roger Federer, who won his 19th earlier this summer at Wimbledon. 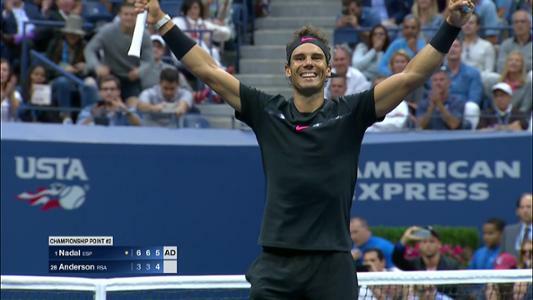 Nadal is now one of only six players in the Open era to win at least three US Open men’s singles championships, along with Federer, Pete Sampras and Jimmy Connors, who have five each; John McEnroe, who has four; and Ivan Lendl, who won three. 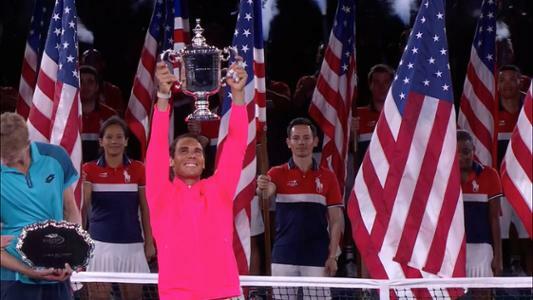 "Been a great two weeks," Nadal said after his triumph. "Increasing level of tennis, increasing of confidence during that two weeks. Yeah, I have this trophy with me again here in New York. There is no better way to finish the Grand Slam season for me after a very emotional season in all aspects. "So very happy the way that I played, happy the way that I managed the pressure, and the way that I was competing during the whole event. Playing better or worse, the competitive spirit have been there in a very positive way all the time." On Sunday, Nadal crafted two breaks of serve in the first set, one decisive break in the middle of the second and another to begin the third in a display of near-perfect tennis. The world No. 1 never faced a break point on his own racquet – Anderson never won more than two points in any one of the Spaniard's 14 service games until Nadal was serving for the match – and he made an almost unfathomably low 11 unforced errors (to 30 winners). In a two-hour, 24-minute final against a player whose penetrating ground strokes can cause even the most ardent baseliner problems, miserly doesn't do it nearly enough justice. Such was Nadal's dominance on serve, he dropped just 15 points. For perspective, Nadal won nine points on Anderson's serve in the South African's second service game of the match alone, a game Anderson ultimately ended up winning. The performance of the top seed was as clean and clinical as you'll see in a championship match, regardless of the opponent. Coming into the final, the biggest questions hinged on Anderson's serve and specifically whether he could hold enough times to get deep into sets, where a big serve or two could earn him a set. Nadal's game plan was easy to see from the start, slicing backhand returns to disarm the South African's power, then utilizing his trademark topspin forehand to give himself plenty of room for error over the net, while still forcing his 6-foot-8 foe to hit balls at eye level. Anderson was forced to save two break points in each of the third and fifth games of the opening set, but his bend-not-break approach faltered when Nadal broke in the seventh game as Anderson missed a forehand down the line. And Nadal broke again in the ninth game to capture the first set after 58 minutes, chasing Anderson wide and deep to the forehand corner to set up a simple volley at the net. Nadal spent most of Anderson's service games no more than two or three feet in front of lines judges at the back of the court. He was essentially as far back from the baseline as the baseline is from service line. From here, he got into the Anderson serve time and time again. It was a different kind of dominance than we saw against Juan Martin del Potro – when Nadal played near-perfect tennis over the final three sets of a 4-6, 6-0, 6-3, 6-2 victory – but it was no less impressive. "Kevin was trying to play aggressive during the whole match," Nadal said. "I think I was serving solid until the last two games that I was more nervous and I served worse. The rest of the match I think I served solid with good percentage and having taken advantage all the time. "I don't know if is him or me, is a combination of both things always But I think I played the right match, the match that I have to play. I put a lot of balls in. I let him play all the time, and that was my goal. To try to have long rallies, to try to have long points, because he will try to play short." In the second set, the Spaniard forced a key break with Anderson serving at 2-3, keeping him off balance with a volley that sent him to his right then another that had him reeling to his left, eventually setting up an emphatic smash and earning an all-to-familiar roar from the lion from Manacor. But time and time again, Anderson had no answer for Nadal’s aggressive baseline game and shot-making. The South African kept coming forward, looking to change his fortune against the world No. 1, and while his transition game from baseline to net was good, it needed to be great. All too often he found himself an easy target. Even when he made the first volley, the next ball came fizzing right by much too quicker for him to handle. Anderson dropped serve when he sent a forehand long in his first service game of the third set, one of 40 errors on the day, and Nadal forged ahead behind four more consecutive holds. The No. 28 seed held to make it 5-4 in the third set, but Nadal put the finishing touches to a spectacular second week when, after two hours and 27 minutes of captivating tennis, he came in behind a wide serve and tucked away a backhand volley into the open court to seal the victory. "It's definitely a few emotions and experiences I'm going to take from this whole two weeks," said Anderson. "Obviously very pleased of making my way through to the finals and having that experience. "A few players get that chance. It's very tough. To step out on court against Rafa tonight, I learned a lot of lessons. It was a difficult match, up against somebody who has been on that stage over 20 times before. Definitely a few things I needed to have done better. Obviously I had my work cut out for me, but I think overall, obviously it's been a very, very positive two weeks for me." When the now-16-time Grand Slam champion arrived on the grounds of the US Open three weeks ago, he took time out of his practice to gaze at the solar eclipse, calling it a once-in-a-lifetime event. On Sunday, in front of a capacity crowd inside the biggest tennis stadium in the world, Nadal stood alone as the brightest star of the tournament as more than 23,000 tennis fans from across the globe watched in equal parts awe and wonder, a must-see event of its own. WHAT IT MEANS: If there was any doubt about Nadal slowing down after celebrating his 30th birthday, those questions have been answered emphatically. Twelve years after winning his first title Grand Slam title in Paris, Nadal is back in the winner’s circle again. Between 2005 and 2014, Nadal won at least one major title each year. That decade-long run ended in 2015 and was replicated in 2016, leaving some to question how much was left in the Spaniard’s once-indefatigable tank. But a record 10th title on the Parisian clay earlier this year gave him his first major trophy in three years, and now he is biting the handle of his second Slam silverware of the past three months. Nadal has now won at least two majors in the same year four different times. He won the French Open and Wimbledon in 2008, the final three Grand Slams of the year in 2010 and the French Open and US Open in 2013. MATCH POINT: Nadal has long been lauded for his clay-court prowess, and rightfully so. His credentials on the European dirt are unparalleled, and his 79-2 record at Roland Garros is almost certainly never going to be surpassed. But lost in that dominance is his all-surface game. This is now his fourth hard-court Grand Slam singles title to accompany the two he won on Wimbledon’s lawns in 2008 and 2010. We’re running out of superlatives to describe the popular Spaniard who has worn his heart on his sleeve his entire career. As he closes the gap to Federer again, his latest win clouds the “Greatest of All Time” debate once more. September 10, 2017 - Rafael Nadal reacts to beating Kevin Anderson in the Men's Singles Final at the 2017 US Open. September 10, 2017 - Kevin Anderson walks out on court prior to the Men's Singles Final against Rafael Nadal at the 2017 US Open. September 10, 2017 - Rafael Nadal walks out on court prior to the Men's Singles Final against Kevin Anderson at the 2017 US Open. September 10, 2017 - A Net Generation kid participates in the ceremonial coin toss with Kevin Anderson and Rafael Nadal in the Net Generation "Kids on Court" Demonstration before a final match at the 2017 US Open. September 10, 2017 - Rafael Nadal in action against Kevin Anderson in the Men's Singles Final at the 2017 US Open. September 10, 2017 - Kevin Anderson in action against Rafael Nadal in the Men's Singles Final at the 2017 US Open. September 10, 2017 - Rafael Nadal in action against Kevin Anderson in the Men's Singles Final match at the 2017 US Open. September 10, 2017 - Kevin Anderson in action against Rafael Nadal in the Men's Singles Final match at the 2017 US Open. September 10, 2017 - Rafael Nadal shakes hands with Kevin Anderson after winning the Men's Singles Final at the 2017 US Open.